Before Basil and Bruce donned the mantel of Sherlock and Watson, Arthur and Ian thought they'd have a go. And they did, in the following 81 minute movie made in 1931. It was Directed by: Leslie S. Hiscott; and Starred: Arthur Wontner, Ian Fleming, Jane Welsh, with Norman McKinnel. I know this may sound rather far fetched, Doctor Watson (Ian Fleming). Yet for quite some time now I've had a hunch that one solidarity figure is behind most of the crimes in our city. Yes. I'm not pulling your leg, old bean. I'd say a good example of this would have to be that bank robbery reported to me earlier in the day by Inspector Lestrade (Philip Hewland). You know. That one where the perpetrators got away with a printing press whilst one of the security guard's perished in the act. And as for another of these crimes, well, do you remember telling me about Kathleen Adair's (Jane Welsh) older brother, Watson? What's his name again? Yes. That's the chap. That unscrupulous card-shark called Ronald (Leslie Perrins). Well, somehow, somewhere, and sometime, I have a sneaking suspicion he will meet the mastermind behind this bank robbery, and when he does, he will also get himself into a lot of trouble. Still. That's most probably why what next transpires all gets rather deductive when a shrouded figure enters the room and says to me, 'Hello, Sherlock Holmes (Arthur Wontner). My name is Professor Moriarty (Norman McKinnel). Pleased to meet you'. As Mrs. Hudson (Minnie Rayner) has something to say - it's never easy keeping crime at bay - a card-shark takes a disastrous shuffle - and at the end of the day, a bad man looses out in the eventful kafuffle. 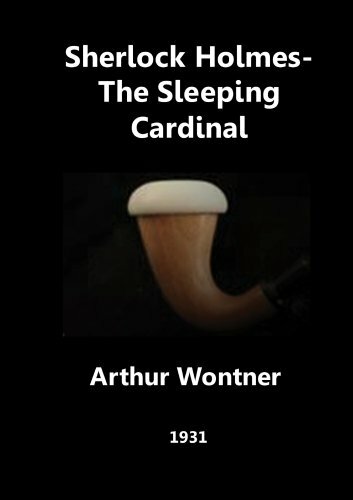 If you're the type of Sherlock Holmes fan who has no qualms about watching a great mystery that appears rather dated upon the screen, then look no further, my friends, because 'The Sleeping Cardinal' is defiantly a film for you. Essentially it is one of those adventures that has it all, and it has it all in spades. It has an air of genuine authenticity about it that I'm sure Conan Doyle would be proud of. It has a great story-line that unfolds itself in a gradual manner, without making anything seem either too convenient or too staged by proxy. And on top of all that, every single one of the main players has some time to shine, including the mostly forgotten bit-player, Mrs Hudson. In fact, one of my most favorite scenes was the one where she was cleaning up after Sherlock and Watson, and starts moaning to them both as to why they don't tidy up after themselves. I also loved that sequence where she argued with her next door neighbour's daughter, plus how she was utilized at the very end of this piece. And the reason why I say this, my friends, is because I felt her inclusion added a very 'Down to Earth' quality to these proceedings. Almost rooting the entire story-line into some sort of 'real' or 'natural' pretext. Now please don't get me wrong. Mrs Hudson isn't at the very heart of this movie. 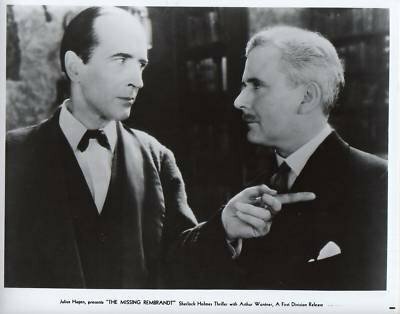 If anything, what's at the heart of this movie is Sherlock's introduction to Moriarty, as well as illustrating -- once again -- how he and Watson are a brilliant-brilliant double act. A double act, I might add, that is one part logical, one part warm, and one part incrementally challenged. A good illustration of this can be found nearing the end of this film, when Sherlock starts blathering on about one thing or another, seemingly making himself comes across like a blithering old fool. But of course, Sherlock being Sherlock, nothing he does throughout the duration of this movie is done in a foolish capacity. And this is highlighted at the very end of it, when he eventually explains to Watson why he acted in the way he did before. As a matter of fact I thought this particular nuance was very commendable on Arthur's portrayal of Holmes, because it does make sense within the confines of this tale, whilst making me wonder why he isn't mentioned more often when a Sherlock Holmes project is stated in the press. Anyway. That's a subject for another day, dear reader. As I'm sure by now you got the basic gist of what I thought about this marvelous murder mystery. The tale was a solid one. The actors were on point. And even though the production values weren't the best I've ever seen, still, it could've been worse. Just look at the following filmic facts, Ha! (1) 'Julius Hagen Productions' first released this adventure in England on the exact same month the first Bela Lugosi Dracula movie was released. It was in February, 1931. (2) Loosely translated, this project was entitled 'The King Of The Shadows' in Italy, and when it was shown in America four months later, is was given the alternate title, 'The Fatal Hour'. (3) The majority of this movie was shot at 'Twickenham Film Studios', situated within the English county of Middlesex. (4) One of the taglines used to promote this picture, was, 'Read by millions: The World Greatest Detective'. 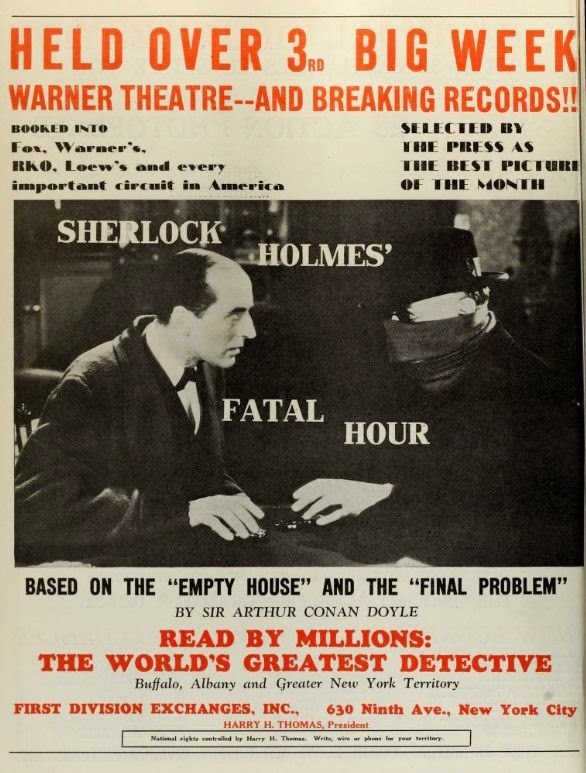 (5) This flick was limply based on two Sherlock Holmes stories written by Sir Arthur Conan Doyle. The first one was 'The Adventure of the Empty House' published in 1903. Whereas the second story was 'The Final Problem' published in 1893. (6) For many years it was believed that this production was lost in the archives, yet it was eventually discovered in an unnamed location situated somewhere within the United States. (7) While I'm on the subject of lost films, according to legend, this one is an adaptation of the very first Sherlock Holmes film ever made. It was developed in 1905 and called 'Adventures of Sherlock Holmes', starring 'Broncho Billy' Anderson as the title character. And yes, it is still presumed lost. 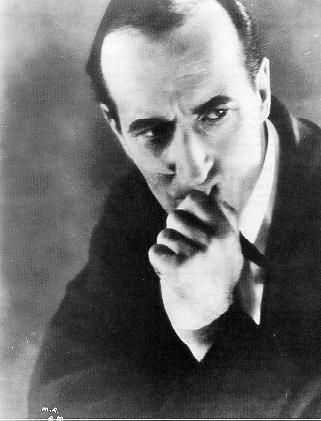 (8) After this mystery murdered a monkey, Arthur Wontner starred in the crime-drama, 'A Gentleman of Paris'; Ian Fleming starred in the next Sherlock Holmes movie, 'The Missing Rembrandt'; and Jane Welsh starred in the filmic-short, 'Two Crowded Hours'. Overall I'd say 'The Sleeping Cardinal' was one hell of a great murder mystery for any of you Sherlock Holmes fans out there. The style seemed very authentic for its time, and in a round about way it does tell of Sherlock's first meeting with Moriarty. What's more, the characterizations were spot on, and as push comes to shove, I say, old chap, this is one splendid slice of Sherlockian cinema.